Snow Continues – Officially Castle Rock’s First Snowfall of the Year! Snow continues across the urban corridor at this hour, in Castle Rock we are even starting to see a bit of accumulation on grassy areas and now roadways. Be sure to take it slow out there if you’re driving, the roads will begin to get slick as temperatures drop. We have also officially recorded over 0.1 inches of snow for Denver and Castle Rock, making this the first official snowfall of the year! The HRRR continues to show a bit more accumulation through the evening hours. Most areas along the front range look to finish in the 1-3 inch range for total accumulation. I’d bet some areas in and around Castle Rock see the 2-4 inch range if temperatures drop quickly enough and the storm lingers a bit. The graphic above shows the predicted radar loop for the next several hours. 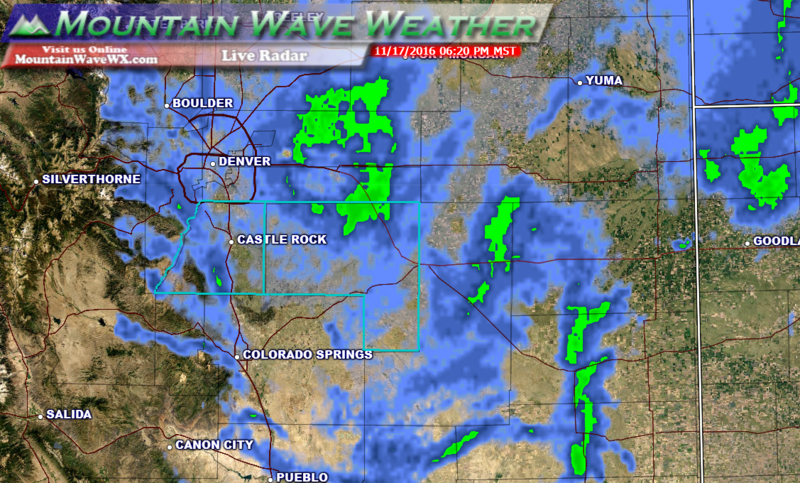 It keeps snow on and off along the front range for a couple more hours, tapering off by 8-10PM. The main energy of the storm has actually moved East and left Colorado but we’re seeing a lot of wrap-around moisture with up slope flow fueling snow showers in the area. Snow will continue for a few more hours, accumulations will generally be light but some areas are seeing higher than predicted snow on the ground already. This seems to be due to temperatures dropping much quicker than anticipated. Expect storm snowfall totals to end up around 1-3 inches in and around Castle Rock with a few areas seeing locally higher amounts. Snow looks to be ending around the 8-10PM time frame as the storm’s energy moves East. While this storm does not look to be a major snowmaker for Colorado at this point, we are seeing roads become icy and slick. The amount of moisture on the roads combined with dropping temperatures is causing ice and slush to accumulate. While this storm will not strand you in your car, it will make travel conditions tricky mainly in the form of icy roads. Please slow down and be careful! Consider postponing non-essential travel until CDOT gets a chance to catch up! Live look at our front range radar. Although the storm’s energy has moved East of the state, wrap around moisture and upslope are keeping showers going in the area. Expect the snow to begin to taper off in the next couple of hours. Notice the heavier bands of snow are already drifting East of the front range. Thx! No weatherbstation is reporting how much we will get. Appreciate you filling us in. Thank you Pamela, looks like snow totals will be an inch or two higher than we predicted, but we are pretty close overall! Did the rest of this comment get cut off?